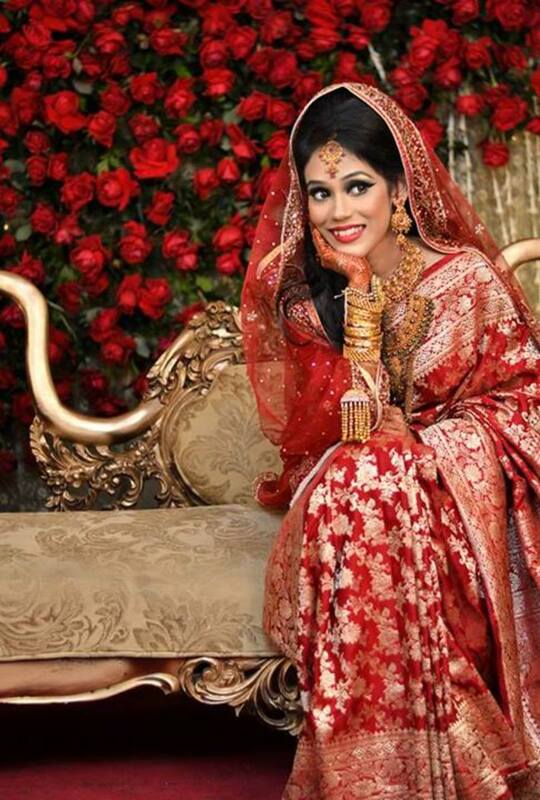 The inherent attraction towards the colour red is uncanny in Southeast Asian countries like Bangladesh, India and Pakistan and this is seen in higher concentration among Bengali ladies, a.k.a women from Bangladesh and West Bengal (Calcutta). One of the main reasons I can pinpoint to is the colour theme of their new year (in Bangla it is called “Pohela Boishakh” which mean first storm of the rainy season and this marks the Bengali new year). The colour theme of Bengali new year is red and white, which in itself is a classic combination. That aside, red is widely used as a bridal colour and the colour denotes happiness and boldness. This post is all about Red and white sarees and saree blouse designs as a combination and also separately. 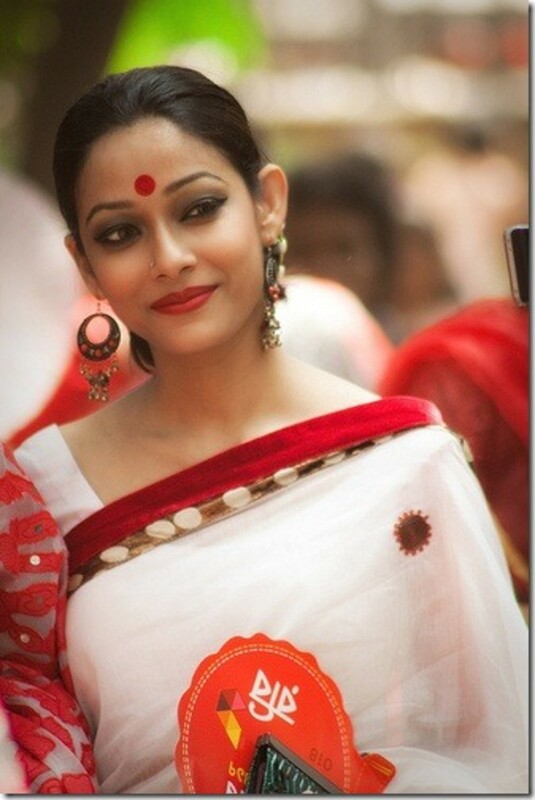 Lots of gorgeous photographs of mostly Bengali women in bright red sarees with white combination or vise versa can be seen here. White chiffon saree with red sleeveless saree blouse. While some prefer white sarees contrasted with red pallu or achol (the end part of the saree is called pallu in hindi and achol in Bangla) others prefer to be loud and brighter in red sarees contrasted with white saree blouse. It is always a matter of preference as well as the occasion for which the saree is to be worn. 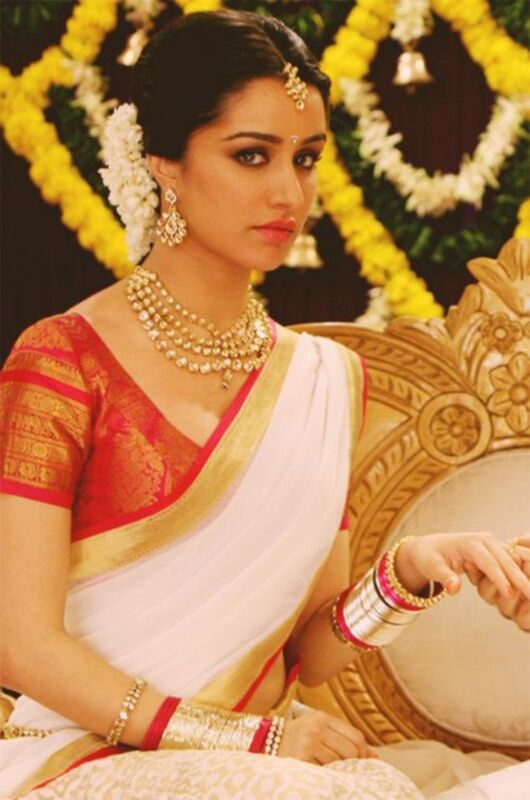 Either way this combination of red and white in traditional saree look amazing. On the right she is looking absolutely stunning in her chiffon white saree with very delicate gold border. 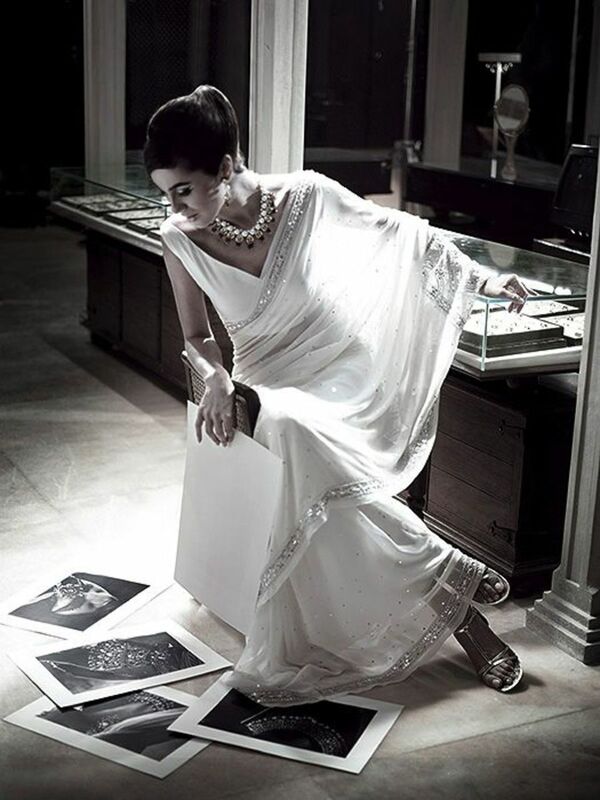 The sleeveless red saree blouse was the perfect pair up with this sophisticated white chiffon saree. 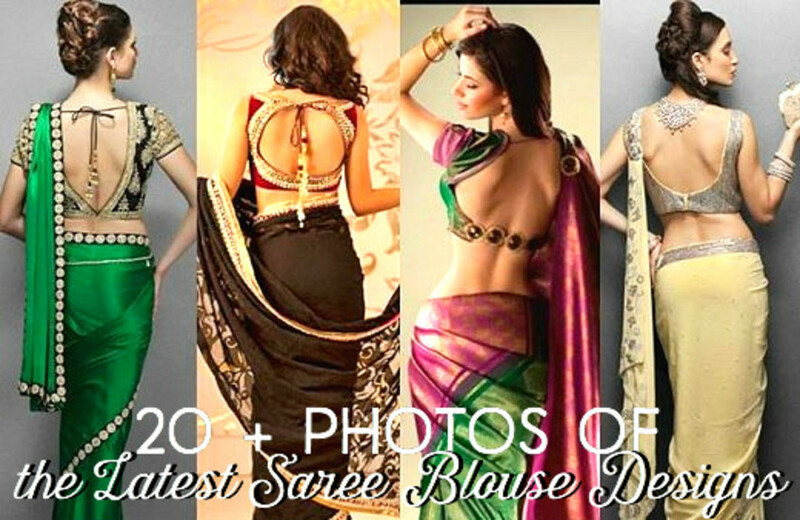 The red saree blouse looks more vivid next to the white of her saree due to the fact that it’s made of red velvet. Nothing can beat a traditional katan saree in white with gold butis all over with red blouse. She tried to mix and match traditional saree with a bit trendy blouse by adding transparent sleeves. 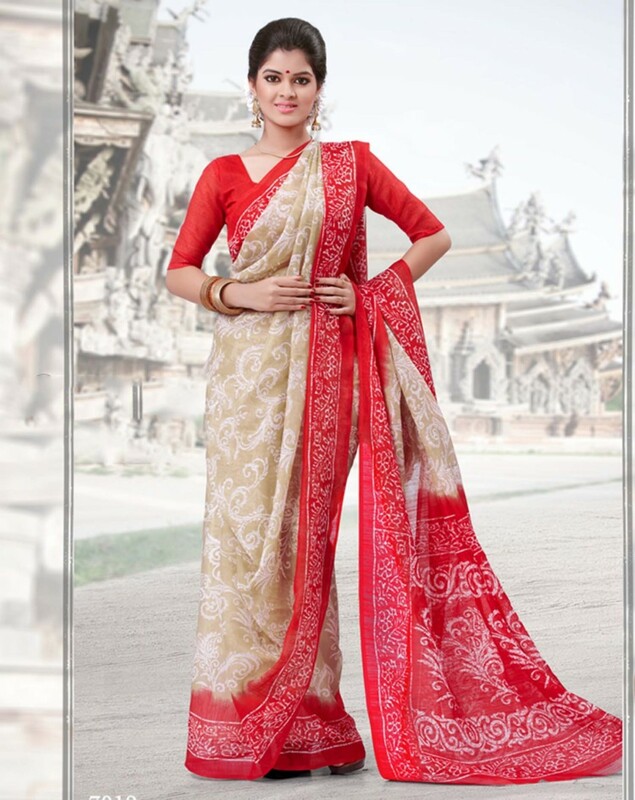 The red brocade blouse looks very good with this type of off-white katan saree. Bollywood actress, Bipasha Basu always looks gorgeous in saree and it needs to be noted that she is after all a belle from West Bengal. Her big eyes and wide smile looks perfect for sarees. Here Bipasha is wearing a very classic white saree with gold zari work all over. 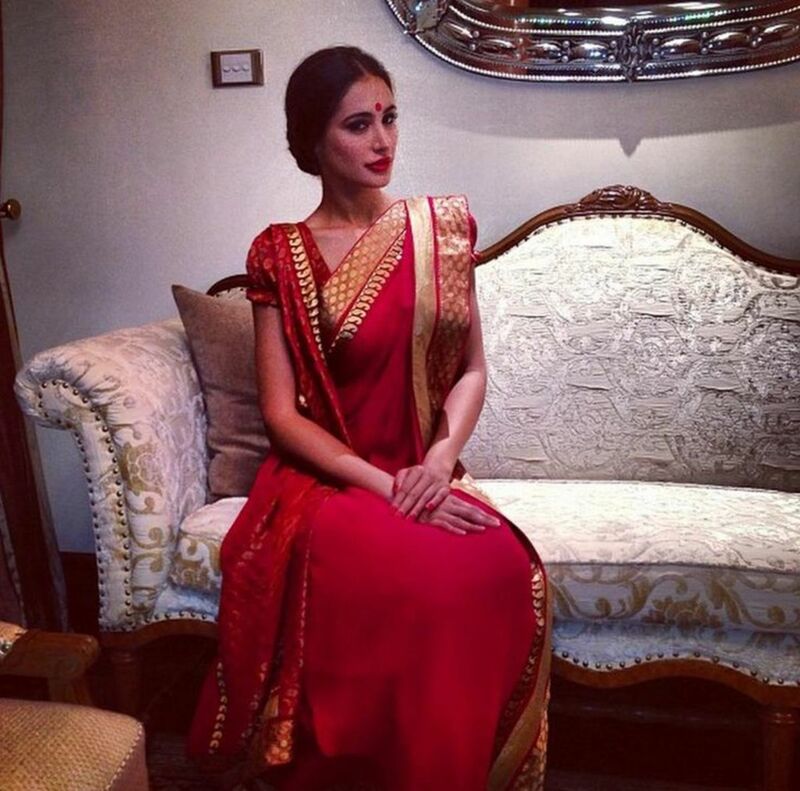 She is wearing the saree in what is called the Bengali Saree draping style. This style of saree wearing looks most becoming when worn with puffed sleeve blouse, also called goti sleeve sari blouse. The great thing about sarees is its versatility. 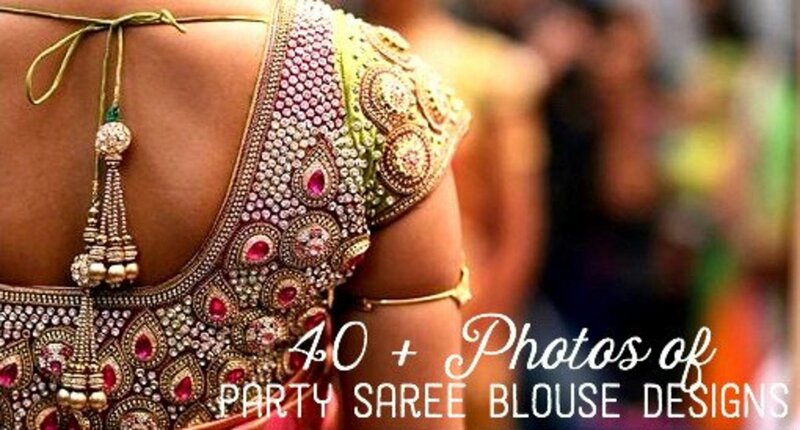 Sarees can be worn in so many different ways that every saree can look completely different depending on the style in which it is worn and also the blouse it is worn with. Here the lady is wearing a simple deep red chiffon saree with thing gold zari border. Because she paired the deep red chiffon saree with this deep red lace blouse the look of the saree changed and looks more westernized saree style. Red sarees look most gorgeous when it is in katan. Katan red saree with all over zari embellishments look very traditional. This type of red saree is most suitable for a newlywed woman. Sometimes it is not necessary to put any contrast to a saree and this type of heavy zari work saree is one of them. This red saree looks beautiful with matching red blouse which is kept simple. This type of Gorgeous katan saree looks good when worn with three quarter sleeve blouse as she is wearing but can also be worn with short capped sleeve blouse and puffed sleeve sari blouse. That is indeed a nice observation. It is true that women from the Asian subcontinent look most suited in sarees.